SNITZEL (AUS) (Bay 2002-Stud 2006). 7 wins-4 at 2, MRC Oakleigh P., Gr.1. Champion Aust. Sire twice. Sire of 975 rnrs, 725 wnrs, 89 SW, inc. Trapeze Artist (ATC TJ Smith S., Gr.1), Shamus Award, Estijaab, Redzel, Summer Passage, Invader, Russian Revolution, Hot Snitzel, Sweet Idea, Sizzling, Snitzerland, Wandjina, Heavenly Blue, I Am Excited, Spill the Beans, Menari, Showtime, Snitty Kitty, Thronum, French Emotion, Time for War, etc. Hurricane Jack (g. by Snitzel). 2 wins. See below. GRACEFUL ANNA (Canny Lad). 6 wins to 1400m, A$1,031,050, BRC Vo Rogue P., Gr.3, GCTC Magic Millions 3YO Trophy, RL, Silk Stocking H., L, Magic Millions Wyong 3YO S., 2d ATC Breeders Classic, Gr.2, Liverpool City Cup, Gr.3, Millie Fox H., Gr.3, STC N&A Group 2YO H., 3d BRC BTC Classic, Gr.3, Pilates on Collingwood Mick Dittman P., 4th BRC QTC Cup, Gr.2, ATC Birthday Card S., Gr.3. Producer. Kita Teamwork. Winner at 1200m in 2018 in Malaysia. Millington. Winner at 1300m in 2018-19 in Aust. SHE CAN SKATE (Bradbury's Luck). 4 wins at 1100m, 1200m, A$237,160, VRC AR Creswick S., L, MRC PFD Food Services H., MVRC Simpson Construction H., 2d MRC Hyland Race Colours H., 3d VRC GH Mumm S., Gr.3, MRC Maxie Howell H.
Skiddaw. 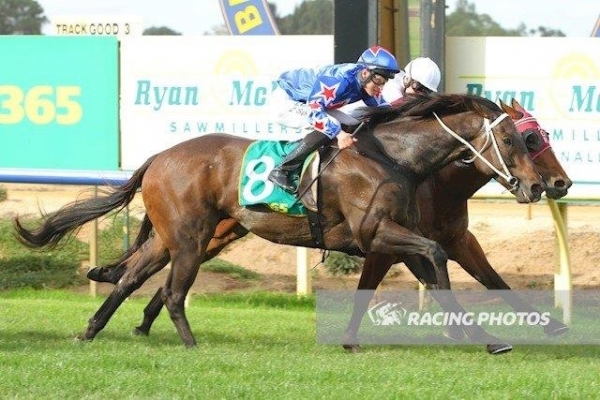 6 wins-1 at 2-at 1200m, 1300m, A$168,925, AJC Autism Association of Australia H., Royal Australian Engineers H., QTC Fasliyev H., STC Tooheys New 2YO H., 2d STC Rivkin Group H., AJC Convention Centre 2YO H., Sydney's Best H., Grandstand H., STC Manildra H., Guildford Leagues Club H., Hastings 2YO H., VATC Silver Bounty H., 3d STC BMW Australia H., Thomas Group Hotels Series H.
Lunar Lad. 4 wins-1 at 2-at 1000m, 1200m, AJC Illawong H., 2d AJC Scobie Breasley H., STC Gow's Heat H., 4th STC Eskimo Prince H., L.
FORCE APOLLO (Catrail). 6 wins-1 at 2-to 1400m, A$331,580, STC Heritage S., L, Darby Munro S., L, 2d NSW Tatt's RC Roman Consul S., Gr.3, Hawkesbury RC Safilo Cup, L.
Caltra (Sovereign Red). 4 wins. See above. Race Record: 30 Starts 2-4-5 A$56,195. 2 wins at 1200m to 2018-19, 2d WATC Supremacy S., L, 3d WATC Melbourne Cup at Ascot H., Heineken 3 H.
21/Sep/2015 3rd of 4 --trial--WATC Barrier Trial, 850m. Ellicazoom was 1st and Gangbuster 2nd. 01/Feb/2016 2nd of 6 --trial--WATC Barrier Trial, 400m. Sovereignty Lady was 1st and Rebello 3rd. 08/Feb/2016 1st of 8 --trial--WATC Barrier Trial, 1000m. Mekie's Dream was 2nd and Quiet Whisper 3rd. (14.8) WATC Karrakatta P., Gr.2, A$506,750, 1200m, time 1:11.14. Track good(4). Carried 56.50kg. Whispering Brook was 1st and Spangled Impact 2nd and Saul's Special 3rd. Trainer: N D Parnham. Owner: Ridgeport Syndicate(Mgr: S E Guagliardo). Jockey: S Parnham. 27/Sep/2016 5th of 11 --trial--WATC Barrier Trial, 1000m. Yeah Dardy was 1st and Winedown 2nd and Silver Roller 3rd. (10.3) WATC Corporate Membership Maiden P., A$16,250, 1200m, time 1:11.48. Track good(4). Carried 57.50kg. Santiago Gal was 1st and Vagabond Boy 2nd and Del Sur 3rd. Trainer: N D Parnham. Owner: Ridgeport Syndicate(Mgr: S E Guagliardo). Jockey: S Parnham. (7.5) WATC Opening Day H., A$32,500, 1400m, time 1:25.23. Track good(4). Carried 56.00kg. Rising Sea was 1st and Mr Undercover 2nd and Roughead 3rd. Trainer: N D Parnham. Owner: Ridgeport Syndicate(Mgr: S E Guagliardo). Jockey: S Parnham. (6.0) WATC Get the Tabtouch Maiden P., A$15,000, 1200m, time 1:13.31. Track good(4). Carried 58.00kg. Metal Rain was 1st and Costa Oeste 2nd and Magic Mint 3rd. Trainer: N D Parnham. Owner: Ridgeport Syndicate(Mgr: S E Guagliardo). Jockey: B Parnham. (8.5) WATC Ascot Racing Carnival H., A$17,500, 1200m, time 1:11.50. Track good(4). Carried 58.00kg. Multiverse was 1st and St Bel 2nd and Valtimor 3rd. Trainer: N D Parnham. Owner: Ridgeport Syndicate(Mgr: S E Guagliardo). Jockey: J Brown. (12.0) WATC Tabtouch H., A$17,500, 1300m, time 1:19.77. Track soft(5). Carried 58.00kg. Oliver's Travels was 1st and Valtimor 2nd and My Naughty Blonde 3rd. Trainer: N D Parnham. Owner: Ridgeport Syndicate(Mgr: S E Guagliardo). Jockey: S Parnham. 16/Jul/2018 6th of 7 --trial--Wodonga TC Barrier Trial, 800m. Grandes was 1st and Ghost Doctor 2nd and Eagle Point 3rd. 12/Aug/2018 4th of 6 --trial--Murrumbidgee TC Barrier Trial, 1000m. Spunlago was 1st and Willi Willi 2nd and Enconti 3rd. 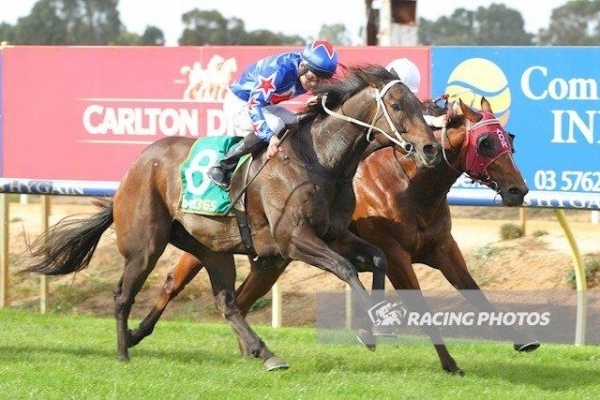 (11.8) Echuca RC Independent Cranes H., A$20,000, 1312m, time 1:19.28. Track good(3). Carried 57.50kg. Second Marriage was 1st and Admission 2nd and Red's Sister Rosie 3rd. Trainer: Andrew Dale. Owner: A Dale & A Grantham. Jockey: J Duffy.